I would like to receive Push Notifications on my iPhone (instead of using expensive SMS gateway services). Is there a solution for this? Important notice: As of PRTG core server version 14.x.13 and PRTG for iOS 14.3.6 resp. PRTG for Android 14.3.2, you can use push notifications with your iPhone resp. Android device without any workaround. 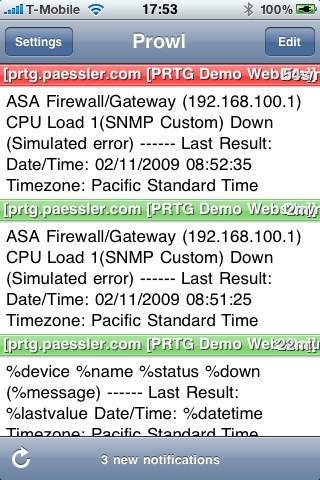 In the past using the Short Message Service (SMS) was the easiest way to send notifications from PRTG to mobile phones. But it required a costly service provider that forwards your message via SMS. And those were not free. Now for the iPhone there is are alternate instant messaging option which are free (or very cheap). There are three iPhone apps that you can use to receive Push Notifications from PRTG on your iPhone. This is our favorite push notification app. It is very simple to install and set up. It is well designed, worked flawlessly in our tests and it is even FREE. The main idea of Boxcar is to watch accounts on social networks (e.g. Twitter, Facebook) for updates which then trigger a notification to your iPhone. But they also implemented the option to use RSS feeds and Emails to trigger notifications, too. The email trigger function is perfect for PRTG. After installing the app you must sign up for a boxcar account. Afterwards you will be given a unique email address on their server. All emails sent to this email will be forwarded to your iPhone using push. All you have to do in PRTG is to set up an email notification which sends an email to this unique address. Click "Add a Service", select "EMail Account" and tap on "Save"
That's it. You will now receive push notifications whenever PRTG finds an alarm. Push 3.0 was also initially designed for Twitter et al. But it also supports email-to-push notifications and a RESTful API. Setup is a little less straightforward and it is not free, but it is still easier to work with than Prowl. Create a free user account on the Prowl website (http://prowl.weks.net/). Go to the "Settings Page" and click the "Generate API Key" button. In our tests the messages were mostly delivered in just a few seconds. Only very few messages took longer (up to a few minutes). 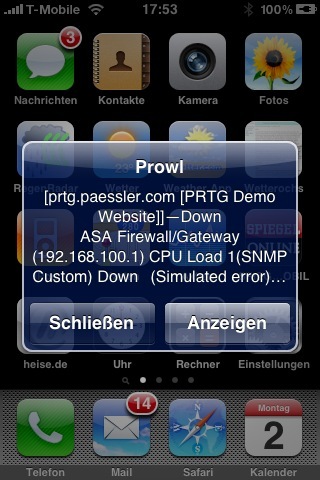 If you want to send push messages using a proxy server, please see How can I send push notifications from PRTG to iPhones via Prowl through a proxy server? Why is there no support for Push Notifications in PRTG and/or iPRTG?